THE JUNGLE BOOK IS MAGNIFICENT – HONORING ITS LITERARY AND ANIMATED ROOTS WITH THRILLING ACTION, GROUNDBREAKING EFFECTS, AND HEART-WARMING DRAMA. When a young human “cub” is left orphaned in the jungle, a good-natured black panther, Bagheera (Ben Kingsley), takes pity on the boy – and delivers the child into the protection of a local wolf pack. The human cub, named Mowgli (Neel Sethi), is raised as a member of the den – and the wolves, along with other animals in the jungle, grow to love and accept the boy as one of their own. With his biological family long gone, Mowgli has little interest in leaving the jungle to join a human village and, instead, has come to live by the etiquette and codes of his animal friends – even hiding a talent for crafting inventions and tools in order to fit in. Yet, no matter how hard Mowgli bends to embrace life in the jungle, one member of the animal kingdom is unwilling to allow a human to live in his midst. Fearful that, one day, this human cub will become a ruthless and powerful man, Shere Khan (Idris Elba), a savage Bengal tiger, commits himself to hunting Mowgli down at any cost. In order to protect his wolf family from Khan’s wrath, Mowgli flees and, on the way, befriends a sloth bear, Baloo (Bill Murray), who convinces the human cub to stay in the jungle – rather than return to the world of man. Thanks to Baloo’s laid-back lifestyle, Mowgli learns to forget about his worries – until Khan begins terrorizing Mowgli’s adopted family, forcing the human cub to return and save his friends. Based on the 1890s’ Jungle Book story series by Rudyard Kipling, on which Disney developed their iconic 1967 animated film, the 2016 live-action Jungle Book sets a high bar for esteemed cartoon movies-turned-modern live-action features. While many fans were initially skeptical when Disney announced live-action reimaginings of their most popular hand-drawn classics, a charming (but still thoughtful) script from Justin Marks, inspired direction by Jon Favreau, and revolutionary effects in The Jungle Book send a clear message: live-action revisions of animated Disney classics can deliver in ways their cartoon predecessors simply could not – assuming the right creative team is in place, of course. 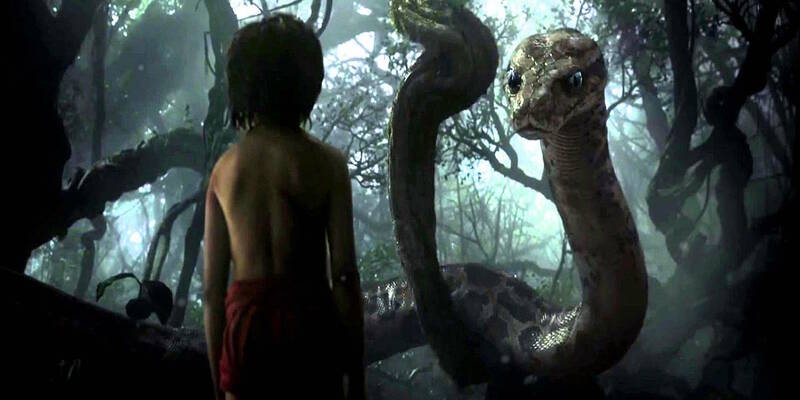 While there have been multiple adaptations of Kipling’s Jungle Book stories, including a 1942 British telefilm, a 1989 Japanese anime television program, and even a previous live-action effort from Disney (Rudyard Kipling’s The Jungle Book in 1994) in which the animals do not talk, Favreau’s remake may, despite the success of Disney’s beloved cartoon, actually be the best Jungle Book movie to date. Understandably, fans still have plenty of reason to enjoy Wolfgang Reitherman’s animated offering, since the two films can both be enjoyed without undermining the other, but revamping the tale in quality (and downright convincing) live-action, emphasizes the wonders, the terrors, and the struggles of The Jungle Book world in ways that classic animation simply could not convey. That is to say, in a story that makes its core point by juxtaposing the threat that “man” poses (to the jungle and its inhabitants) against the vulnerability of a human “cub” raised in that same animal kingdom, Kipling’s work is all the more affecting when the onscreen characters are believable – and relatable (boy and beast alike). In The Jungle Book, live-action is not a gimmick, it’s a tool – and Favreau masterfully utilizes magic realism to emphasize the most important aspects of his heroes and villains. Shere Khan was always a scary antagonist, even as a hand-drawn figure, but seeing the character brought into a real-world aesthetic as a highly-detailed live-action animal (voiced by Idris Elba), that moves and “acts” like an actual tiger, elevates the blood-thirsty villain into frightening new territory – making the threat he poses to Mowgli and the human cub’s animal protectors all the more terrifying. Similarly, where Phil Harris’ Baloo kept children giggling and singing for nearly half-a-century, seeing what appears to be a real sloth bear (voiced by Bill Murray) on screen makes the character’s zany antics, moments of heroism, and honey addiction, especially endearing. In keeping with a bar set by the 1967 animated classic, Baloo is once again the stand out in a film brimming with great characters. Much like the animated film, Mowgli’s journey is limited somewhat by tropes and cliches of similar tales of self-discovery, fragile friendships, and man versus nature allegory – but there’s too much to enjoy in The Jungle Book for the film to be slowed by its shortcomings. Even when Neel Sethi, who portrays Mowgli, occasionally stumbles in bridging the divide between his flesh-and-blood body and CGI animated co-stars, there’s no time to dwell on it – since the young actor gives a brave and lovable turn as The Jungle Book‘s featured human. Ultimately, Sethi succeeds where he is needed most: providing a likable stand-in for the audience, reacting with genuine childlike wonder throughout his various encounters with talking, anthropomorphic, animals along his adventure. The Jungle Book is also playing in 3D and IMAX 3D formats. Where premium tickets are often optional, every filmgoer willing to pay for an upcharge should get their money’s worth this round. Refreshed by a break from blockbuster moviemaking (during which the filmmaker produced his indie hit, Chef), Favreau has produced a beautiful movie, with lush visuals, rousing onscreen action, and inspired recreations of classic hand drawn scenes, all of which are heightened by a quality 3D presentation and superior sound. While it never quite achieves the same 3D artistry as Life of Pi, Avatar, or Hugo, Favreau’s Jungle Book is sure to be praised for its use of the format (and will become a go-to Blu-ray for 3D TV owners looking to show off their home theater setups). The Jungle Book is magnificent – honoring its literary and animated roots with thrilling action, groundbreaking effects, and heart-warming drama. Every classic Jungle Book character is made better, more entertaining, and more poignant by live-action – paving the way for a stirring story that condemns prejudice, celebrates individuality, and contemplates the power of man and nature. While it’s still too early to claim that all of Disney’s planned live-action reimaginings will payoff, The Jungle Book makes a compelling case for adapting certain Walt Disney Animated Classics – and, above all else, proves that a live-action TaleSpin movie needs to happen immediately.